Young Living's Lavender Essential Oil is one of my absolute favorite single essential oil. Lavender has a sweet, floral aroma that is soothing and refreshing. The aroma of Lavender is great for relaxing and unwinding before bedtime, adding to a warm back or diffuse to create a calming and comforting atmosphere. Lavender is steam-distilled from the Lavandula angustifolia, a perennial, busy shrub with a flowery top. The many plant constituents in lavender essential oil contribute to a vast range of usages and the oil can be applied to the skin undiluted or *neat*. 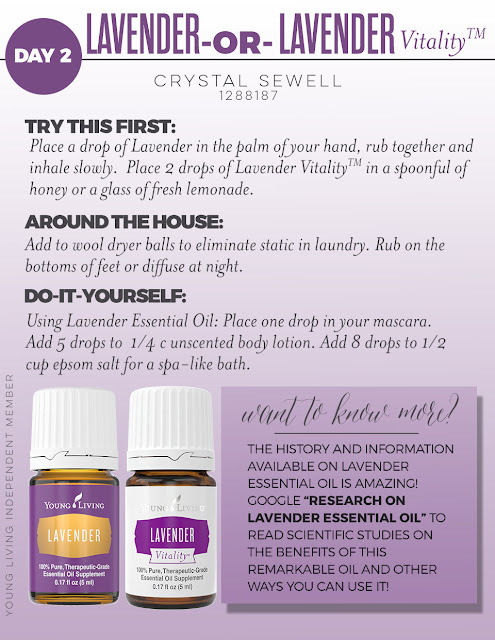 I diffuse Lavender Essential Oil throughout the day in our home. It just helps to create a calm atmosphere for us and our pets. I also make a Sweet Dreams Linen Spray using my Lavender Essential Oil. Mix well in a glass mason jar or glass bowl and add to a warm bath. A great way to use Young Living's Lavender Vitality Essential Oil is making a super refreshing Lavender Lemonade! There are so many ways to incorporate the calming aroma into your daily routine! I challenge you to do your own research to learn all the great wellness benefits Lavender has to offer!